New Blood… not from fingers…..
2014 has brought us lots of new members! So we are currently full to the rafters although we are operating a waiting list so if you are keen please get in touch. We welcome Mel, Ruth, Wil and Yanela. There are lots of new projects and lots of completed projects. Ping has been very productive, completing a giraffe , a peacock and currently working on a reclining Buddha. Elke has made a hare and is now making another. Brigitte is tackling a taxing chain and we have an on-going side line in taxing crossword tackling. Thank you to everyone for the very warm welcome. 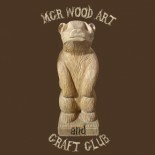 This entry was posted on February 19, 2014 by mcrwacc in wood carving and tagged adult learning, art and craft, life long learning, manchester, night class, puppets, pyrography, sculpture, wood carving, wood turning.